Upper band has a problem with S and Z threaded cards. The lower band has that problem corrected. 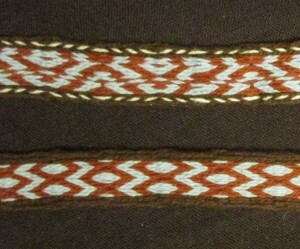 Card weaving is a project that I dabble in in bits and pieces. I like to weave. I like to card weave. I do not like to set up card weaving warps. I have a tendency to get the S and Z direction for warping cards backwards or confused. If I sit down and warp the project in a single setting this does not happen as often. However, I am a parent and uninterrupted time is rare. I think one of the things I enjoy the most about card weaving is my Grandfather’s cards. He made them from an old set of bridge playing cards that my Grandparents must have used in the late 1970’s to the early 1980’s. There is a lot of olive green in the design on the face of the cards. I like the link to the past that my cards represent, as my Grandfather died in 1985 and my Grandmother died in 1998. This band will probably end up as a backpack strap. It is really thick. I must still be interested with card weaving, as I keep buying books. Every once in awhile a new card weaving book will come out that has a lot of history in it. The last book I got has the patterns organized from easy to difficult and I cannot get past pattern 4. 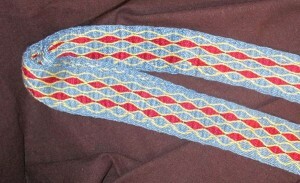 The blue and brown band in the upper picture is from pattern 4.